Walking along the beaches of Sarichef Island, you might find hundreds of sea stars, or you might find bones, bits leftover from subsistence hunting: a seal flipper, the hoof and shin of a caribou. Sarichef is a barrier island off the northwest coast of the Seward Peninsula. A few miles long and a quarter-mile wide, you can stand in the middle and see ocean on both sides. There is one village on Sarichef: this is Shishmaref. Shishmaref has gained national attention in recent years, not for its beauty or its history, but for its future. 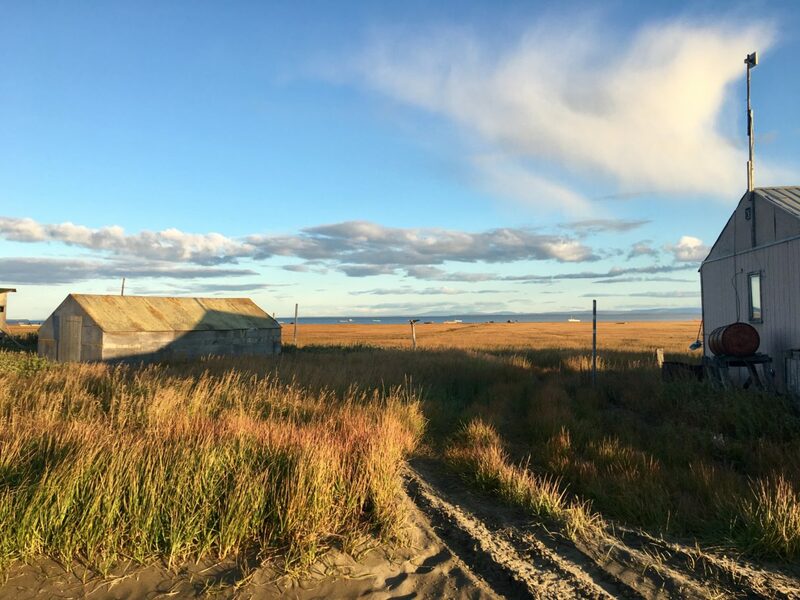 Shishmaref is one of thirty-one coastal communities in Alaska that the US Government Accountability Office found to be in “imminent danger” of flooding and erosion. That was eight years ago. As waves have eaten away the edge of the island, photographs of houses dangling over the sea and collapsing in on themselves had reporters and politicians around the world calling the village of Shishmaref an early victim of climate change. But there’s something wrong with that picture: the people who call Shishmaref home are not just standing by to watch their island wash away. This month on Story49: two stories of young people in Shishmaref who are eager to learn all they can about the changes and challenges facing their home—and figuring out what they can do about it. 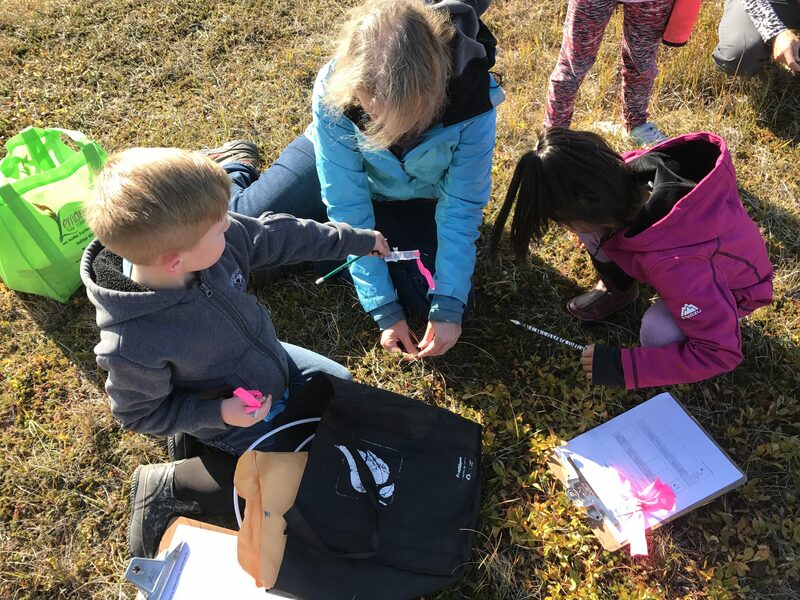 UAF ecologist Christa Mulder (center) tags berries with Manny Trunkey and Beth Kokeok in Shishmaref. Photo: Zoe Grueskin/KNOM. Listen here or tune in on KNOM (780 AM, 96.1 FM) on Sunday, Sept. 17, at 6 pm, then again on Thursday, Sept. 21, at 3 pm. 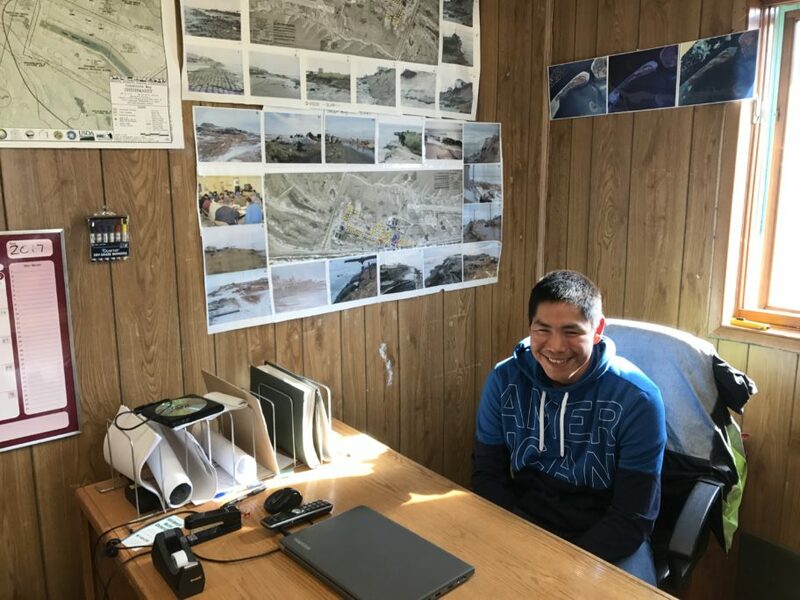 Corey Ningeulook, Climate Change Coordinator for the Native Village of Shishmaref, at his desk. Photo: Zoe Grueskin/KNOM. Corey Ningeulook points out where he hunts on gigantic map of Sarichef Island taped to the wall of his office in Shishmaref. Photo: Zoe Grueskin/KNOM. Beth Kokeok examines a crowberry with a hand lens in Shishmaref. Photo: Zoe Grueskin/KNOM. Jasmine Shaw sits beside a crowberry tagged for the Winterberry project in Shishmaref. Photo: Zoe Grueskin/KNOM. Image at top: Shishmaref in September 2017. Photo: Zoe Grueskin/KNOM. You can learn more about the Winterberry project here. Music in this episode by Mystery Mammal and Podington Bear.